The word pinniped means fin or flipper-footed and refers to the marine mammals that have front and rear flippers. This group includes seals, sea lions, and walruses. These animals live in the ocean but are able to come on land for long periods of time. Millions of years ago, the ancestors of pinnipeds lived on land. These were probably weasel or bear-like animals that spent more and more time in the ocean and eventually adapted to this marine environment. There are three families of pinnipeds: phocids (seals), otariids (sea lions) and odobenids (walruses). Phocids are sometimes referred to as earless seals or true seals and can easily be identified by looking at their ears and flippers. They have ear holes but no external ear flaps. They also have small front flippers and move on land by flopping along on their bellies. At sea, true seals move their rear flippers back and forth like a fish's tail to propel themselves through the water. Another family of pinnipeds are the otariids, sometimes referred to as eared seals. This family includes sea lions and fur seals. You can recognize these animals by their flippers and ears. 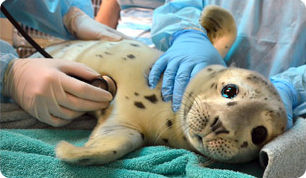 Unlike true seals, they have external ear flaps. Their front flippers are large, and on land they are able to bring all four flippers underneath their bodies and walk on them. In the water, they swim using their front flippers like oars. Fur seals, in spite of having the word “seal” in their name, are actually closely related to sea lions. They have longer flippers than sea lions, along with a rich luxuriant coat of fur that was so prized by hunters that it brought them to the brink of extinction in the 19th century. The third family of pinnipeds is the walrus (odobenids). Both males and females have tusks and vacuum-like mouths for sucking up shellfish from the ocean floor. They have air sacs in their neck that can inflate to allow them to float as if they were wearing life preservers. Walruses are one of the largest pinnipeds, with males reaching over 3,000 pounds (1,360 kg). They live in the North Atlantic and Pacific Oceans, in the arctic region. Walruses are protected under U.S. and Canadian laws, but limited hunting by the Inuit people is allowed. Wonderfully illustrated, this Pinnipedia Poster shows all the pinniped species of the world. Guide to Marine Mammals of the World, a detailed guide to our pinniped pals from the National Audubon Society.